Annual holiday tradition of providing Christmas baskets for our maintenance and security staff as a small token of appreciation. Contents are brought in by students (letter with details in the WeeklyEagle). Every year HS Student Council together with MS and HS students and staff make Christmas Baskets with basic food and cleaning supplies to give out to our maintenance staff, administration staff, Clean Service staff, guards and cafeteria staff to thank them for all they do in our school. Each group will be asked to bring certain supplies. We offer our maintenance staff, Clean Service, and guards an opportunity to buy items in good condition, collected during our drive, at a ver low cost. The money obtained during the bazaar is used for community service learning projects and activities. 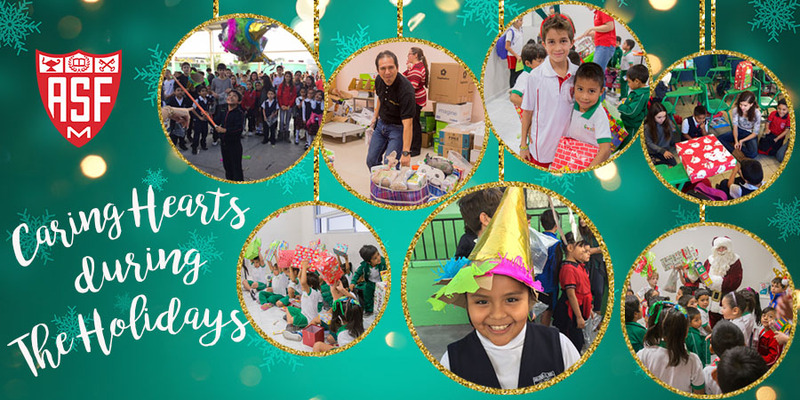 Every year, ASFM teachers show their appreciation for the maintenance, security, and support staff, by purchasing Christmas presents for their children. Teachers can sponsor an "angel" from our virtual Christmas tree, and help make a child's Christmas a little brighter, while saying THANK YOU to our coworkers for all of the hard work that they do. Following our classroom visits to Casa Samuel, students in Third Grade have been inspired to give more to the children in this community. Many students have suggested having a toy drive in order to bring a little Christmas Spirit to the children we met. We are very proud of their initiative! Participating Grade 3 students will be given the name,age, and gender of a child from Casa Samuel. They will pick out a special Christmas gift for that child. A group of student volunteers and teachers will be delivering the gifts to Casa Samuel after school. Students will personally share donated children books in Spanish with students from our SIster Schools in San Pedro and Santa Catarina, during their Christmas Posadas.